Your article left me breathless...I'm cryin' I tell ya! I had no idea that Boo Kitty came from a crime family. At least Mew Kitty is on teh side of rightousness. Keep on Squeaking Truth to Power! Yeah, I couldn't believe it either! That Boo Kitty...came from such a bad brood that I almost feel sorry for her. Thank You for writing a story about the Free KIVA Cause. I hope you have many, many readers that help. My blogspot will get the Message out, too. My Crapal Tunnel Syndrome is in Remission, now. My anut said I cannot respond to any blogspots except on my own blogspot. She said that is how mean fighting people get your goats. But she said I could write to Thank You for the story. And I did. Thanks very much for your letter. 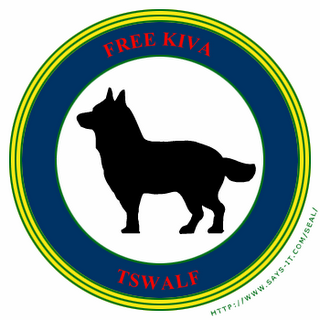 I'm very happy that we can work together to free Kiva from the mean lady. I'm glad to hear that your crapal tunnel is in remission. Please thank you anut for me; it was very nice of her to let you write to me. It sounds to me like Mew Kitty might not have the exact same lineage as Boo Kitty and the other less savory elements of the family. Maybe the influence of an Uncle Tom in the life of the cousins as "Dad"? You better look out Tim. Boo Kitty might not like you casting aspersions on dear sweat Momma Cat like that! Wow...so many revelations in your article; you should be nominated for a PullAtYour Prize™. I'm glad you're promoting "Free KIVA", because I like dogs. Yay! A litter of kittens can have more than one daddy-cat? I did not know that, wow! Free Kiva from the mean lady! MinTeh! WHERE ARE YOU!!! WE MISS YOU. MinTeh, I hope all is well. We miss you on teh wheel. Has teh Debmonster got you? If so, we can send Mew Kitty in for the rescue mission. Seriously, I hope everything is okay. We look forward to you rejoining us at teh wheel. MinTeh! Dude! Where the heck are ya? Teh Wheel's not teh same withouchoo.